Did you know that once every month the Galt holds an Archives Program? The Archives Program is a public lecture or a workshop that showcases archival resources and explains how they can be accessed and used. October’s event (which actually took place in November for Remembrance Day) took a look into the diary of Captain AG Virtue. It was a lecture given by Warrant Officer Glenn Miller. Glenn is a resident of Lethbridge and a retired artillery officer with a vast knowledge of Lethbridge’s war history. Thus, he was the perfect person to present the diary. In March of this year, the Galt acquired the diary. This in itself is out of the ordinary. Most things the Galt Archives has are donations: family papers, city records, Henderson Directories, history books pertaining to our region, and the like. It is a rare and exciting occasion when something is found that the Galt Archives would like to and can afford to buy. These materials also need to be relevant to the history of Southwestern Alberta. So it was quite exciting when a war journal written by a man who had lived in Lethbridge and was an officer in the 61st Battery in World War 1 was discovered early this year on eBay. These are the sort of guns they hauled around. Pretty chunky. Glenn began by giving the audience some context. Here are some things I learned. Lethbridge actually has a fair bit of war history, which was news to me. There are several publications on the topic such as “Lethbridge at War” by Major Christopher R. Kilford. This book describes a number of units that were formed in Lethbridge during WW1 including infantry battalions, cavalry, Royal Navy and artillery units. The Galt’s Collection also has a fair bit of significant military artifacts. Lethbridge had a 20th CFA Battery, 39th CFA Battery, 61st battery, and later a 68th battery, all made mostly of men from Lethbridge. Each battery had only 4-6 guns. Guns were apparently in a shortage at this time. Canada had ordered more from England, but they didn’t have much to spare. However, the guns were fairly huge. One thing Virtue spent some time doing was hauling the huge amounts of ammunition these guns used. They launched big projectiles that blew up and sprayed shrapnel. Shrapnel, I learned, does a fair bit more damage compared to a bullet, because it becomes misshaped and jagged. This pigeon could take aerial photos of the opposition. Another interesting tidbit; pigeons! Pigeons were often used to carry messages. They were surprisingly dependable; 90% accurate, whereas all it took was one cut or broken wire, and the telegraph or phone was disabled. 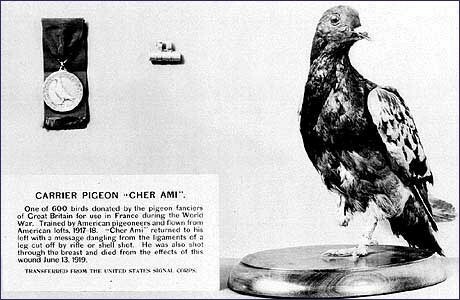 There is the story of Cher Ami (Dear Friend), a pigeon that saved 194 men by successfully getting a message to Major Charles Whittlesey's "Lost Battalion" in France despite being shot in the breast and leg. The message was found dangling from what remained of his shattered foot. Other methods for communication included flags and rockets, whose colors had different meanings. With rockets, it could sometimes be difficult to tell which side the rocket was from, which caused confusion. The diary is written by Abner Gladstone Virtue. He was a lawyer and a partner at a firm here in Lethbridge. He was known for his love of horses. He had two horses of his own, and he was very proud of them. During The First World War he became an officer in the 61st Battery. He received the Military Cross for keeping up with the need for ammunition during a tense onslaught. He survived the war, and soon after his return got married (in his uniform). He continued his career in law here in Lethbridge. While he served he wrote in a little German made diary, almost daily. Somehow this diary ended up in a man’s military collection, who’s son sold it to a military attic shop when his father passed away (The Command Post in Victoria, BC), who put it up for sale on eBay. Through some strange coincidences it has ended up nearly back to where it began! Now, onto the diary itself. Because the diary is hand written, it required transcribing. There were also a few small sections of short hand that required translating. The first thing most people notice after reading it, is how he could write so little and yet express so much. Virtue was a devoted writer. He wrote most days. However, he usually only wrote little fragments of script, capturing the essence of his day in only a few words. “Took 1,700 shells up to the guns today.” “Ugh.” “Got notice going on leave. Slept in a real bed for the first time in a year.” “Wordy war between Steele and Maj. Greene, the latter winning.” These are all separate entries in his journal, capturing what he thought or what stuck out to him to that day. By reading his diary, we get an insight into the war experience. War is one of those things that no one who has not been there can truly understand, but this diary brings the reader closer. His brief snippets provide us with little windows to peer into what life was like as a Canadian soldier in the First World War. This journal provides us with another way to remember the sacrifice given by so many for our freedom. This is the reason we have Remembrance Day every year, to set aside one day to do just that. This diary also reminds us that war has affected the lives of people from our own home town. I can hardly scratch the surface of this diary or of the evening in one little blog post. There is also an excellent article (front page!) in the Sun Times, if you’d like to read it click here. This program happens every month, and I would really encourage you to come to any you might be interested in. The next program will be about preserving your family photographs on December 13th at 7:00PM. Hope to see you there!